Gladstone's Library LibraryGladstone's Library is one of a kind - Britain's finest residential library, and its only Prime Ministerial library. Established as a national memorial to the life and work of the great Victorian statesman, William Ewart Gladstone, the Library is a meeting place dedicated to dialogue, debate and learning. Gladstone's Library has been recognised as the most important research library and collection in Wales after the National Library of Wales in Aberystwyth. It boasts an outstanding and varied collection of more than 250,000 books, journals and pamphlets, with a special focus on the core subject areas of Theology and Victorian Studies. This unique collection is kept up-to-date with the latest publications, which readers can browse on the open shelves. The heart of the Library is Gladstone's own collection of over 32,000 items. Many of his books contain his annotations, some of which are extremely detailed. 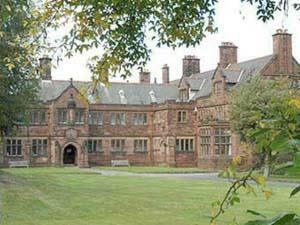 In addition to his books, the Library houses most of Gladstone's non-political correspondence, speeches and papers, which are administered by the Flintshire Record Office, and a number of special collections including the Bishop Moorman Franciscan Library and the Glynne-Gladstone Manuscripts. Gladstone's Library is unique: Britain's finest residential library and its only Prime Ministerial library. As a national memorial to the work of William Gladstone, the Library is a meeting place dedicated to dialogue, debate and learning. The Library's Bistro, 'Food for Thought', is open from 10am - 4pm Monday to Friday (offering Afternoon Tea between 3pm and 4pm) and 10am - 2pm Saturday and Sunday offering a tempting selection of lunches, homemade cakes and Fairtrade tea and coffee. Sunday Lunch is served from 12-2pm (booking is advisable).